Knives have many uses. Two of the most obvious activities in which knives are used frequently are cooking and hunting. Chefs who want to be taken seriously (and who take themselves seriously) always have their favorite knife at the ready. These professionals understand that to show up without their knife is to show up unprepared and naked. In the case of a chef, their knife is an extension of themselves. For hunters or nature enthusiasts, their knives help them tackle activities such as cutting rope or helping them prepare a recent catch. For the knives to be used properly, they need to have a sharp edge. If a knife is blunt or even slightly worn, it’s effectiveness is affected or voided. It slows down the chef who’s trying to concentrate on his overall task and get food prepared quickly. The chef is also working to be precise. A blunt knife is frustrating. A blunt knife is useless. That is why it’s important to keep your knife sharpened and ready. If you don’t, you will lose efficiency. 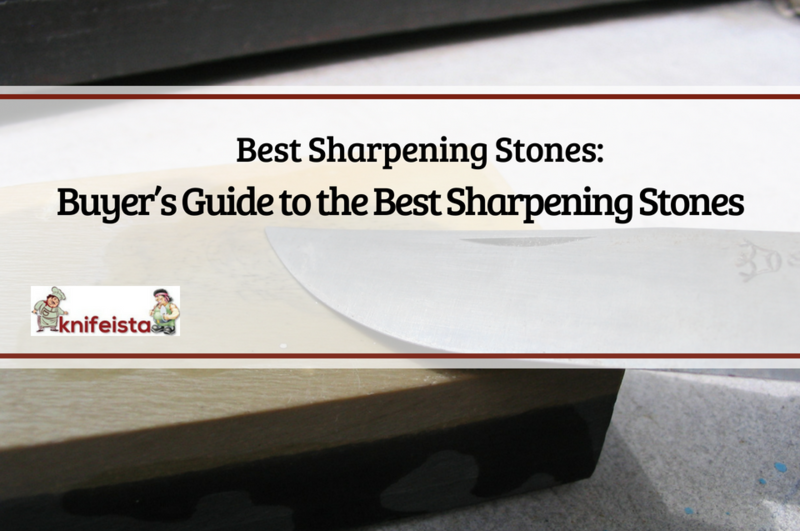 In this guide, we will talk about the importance of using the right stones for sharpening your blade. Then, we’ll give you a review of the top ten blades to use. 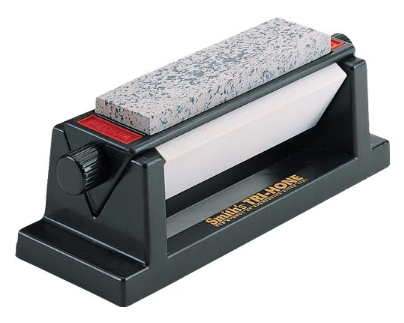 The right sharpening stone can give you the right edge you want depending on the type of knife and the task at hand. There are stones that can be adapted to your environment, like a pocket, portable stones. There are stones you can use while they are wet or dry, to increase efficiency, like in the case of chefs, for example. If you are sharpening a hunting knife, you need a very fine, sharp edge. If you are sharpening a chef’s knife, you need a sharp edge but can sharpen depending on your needs. To maintain the edge requires regular maintenance. This makes it necessary to at times have a quick sharpening method. A sharpening stone or water stone is usually a rectangular, flat stone which can come in a range of fine or coarse grades that you choose. This depends on the type of knife you are sharpening and how sharp you would like the knife. There are a variety of whetstones (whet meaning “to sharpen a knife”) available in both natural and artificial stone materials. 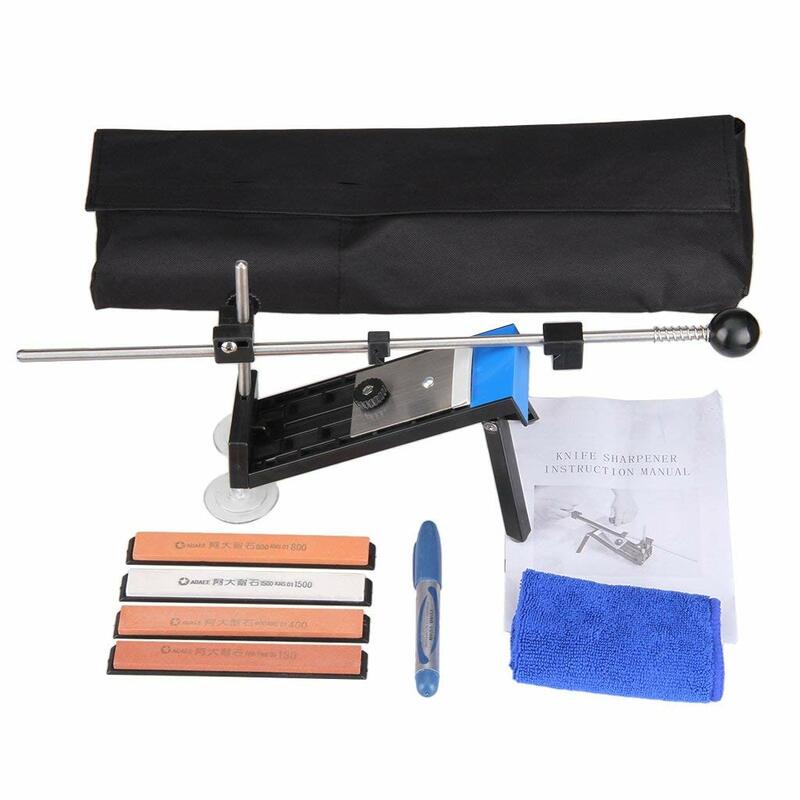 Here is a list of both makers and specific models of the best sharpening stone you can choose for your individual needs. 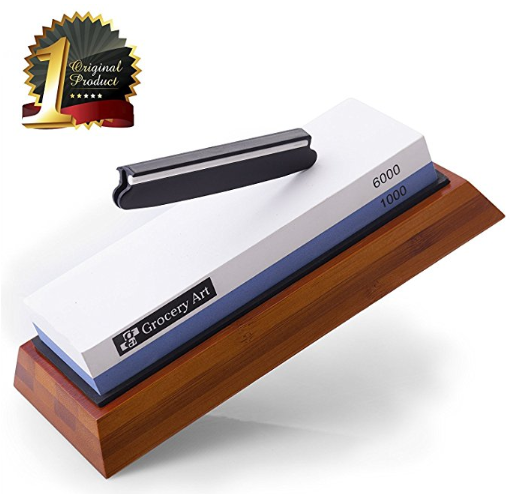 Each example of the best sharpening stone was rated based on ease of use, quality of the stone, and reviews from various blogs with expert opinion. We also considered the reviews of customers who have used the products listed for maximum authenticity. We always rate our examples honestly based on our experience and strive for accuracy by verifying the sources we use for the examples that we choose to use. Simply keep the plane of your knife’s blade vertical and draw the edge along each stone to sharpen. . This brand is extremely popular. The popularity is based on their dependability. When you use a Naniwa product you know you’re using a quality whetstone. They are available in professional 400, 1,000 and 5,000 grit combinations. Feedback is one of the important measures of qualities in sharpeners. Feedback is how the stone feels when you’re using it. Though, feedback doesn’t have an overall effectiveness of the stone but does affect the user’s experience. Naniwa whetstones with grits of 400 and 1,000 give excellent feedback with the 5,000 being harder but still have good feedback. They offer both whetstones that would need to be soaked and “splash and go” stones which you just lubricate with water and use for sharpening immediately. 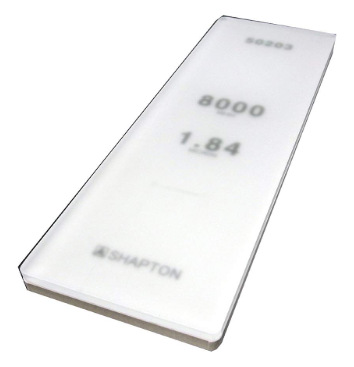 The Shapton Water Glass stones are so called because they are mounted on glass. They are ceramic based and are designed so you only use one side of the stone. They come in a mind-blowing variety of grits from 120 to 30,000! The 320, 500, 1,000, 2, 000, and 16,000 grit stones are fantastic. Though you won’t use them as much as other stones, they excel on sharpened hard steel. The hardest steel is no match for these stones. There is almost no feedback at all on these stones which can turn sharpeners away from using these stones. They are thin, which can give the impression that you aren’t getting your money’s worth. These things aside they will produce the sharpest knives, are very durable and will last a long time. To top it off they are easy to maintain. 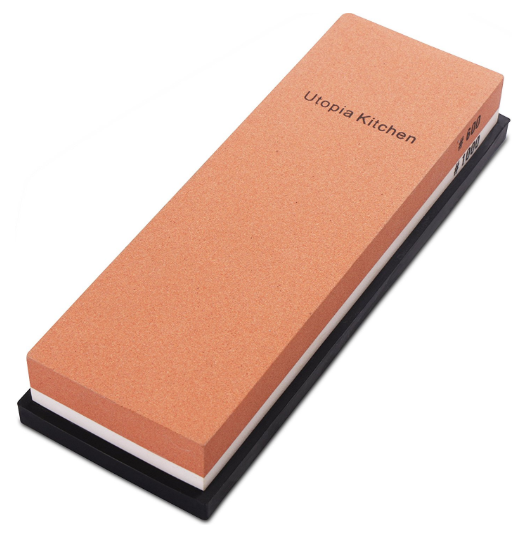 This is the best sharpening stone for daily use and affordability. Here is a review from The Strategist. Another favorite from The Strategist, this whetstone is easy to use and portable for those times when you need a quick, clean sharpen. But don’t take our word for it. Here’s what a user had to say. This is a 12-inch stone complete with two grits. It’s good if you want to sharpen larger knives. Though some users say that the grits are fine, in fact, one side has a very coarse grit with the other side having a medium grit. The downside to this stone is that you would need a fine stone to finish after sharpening with this stone. Besides this, the stone works very well and you will not be disappointed. This stone is also extremely affordable. This is a favorite among knife enthusiasts and is good for those who prefer a little bit of guidance. 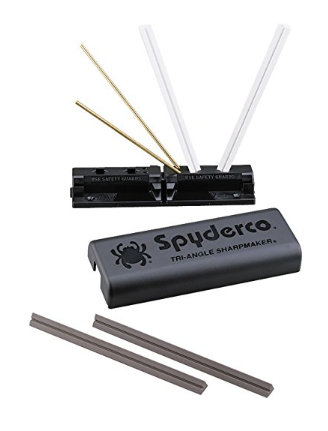 The Spyderco consists of a plastic tray with different slots where you can place two triangular stones at various angles depending on the type of knife you are wanting to sharpen. The guides give you different options for stone placement so you can vary depending on your blade. You hold the base in one hand and the knife on the other. Then, holding the knife perfectly perpendicular to the table, you swipe the knife up the stone toward you, using the other stone for the other side. A good sharpener for smaller knives. Stones are the best way to leave a great polish on your knives, but their use requires proper technique. If you don’t want to spend the time or are just uncomfortable learning how to sharpen your knives on a stone, this is the perfect set. With this set, you strike the knife with the stone instead of the reverse. A clamp holds the knife in place while a guide arm assures that the knife stays at the proper angle. Though this kit was made for sharpening razors, pocket knives, and tools they get the job done. With this kit, you hold the assembly in one hand while striking the stone back and forth over the knife with the other. This kit uses diamond stones rather than ceramic stones which push up the price. It has four different grits. The limitation to this kit is that if your knife is any bigger than 8-inches, which chef knives usually are, you won’t be able to use it. 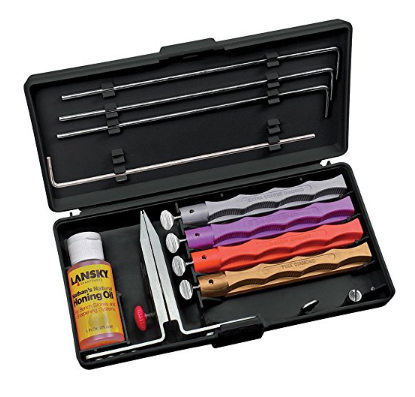 This kit is best used for pocket knives, paring knives and other small knives. This whetstone is a culinary obsession and a welcome change if you are accustomed to using rods are handhelds, which can be frustrating. 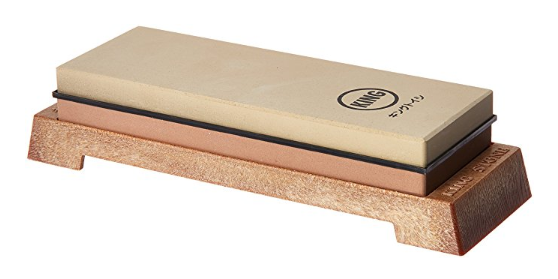 This whetstone can sharpen heavy steel with time and patience though it’s better to start with a stone with a coarser grit. Both sides do need to be used. The 6000-grit side could be used to give your knives that final polish. This set comes with a video and a thorough instruction guide which makes it perfect for novice users. You’ll be sharpening your own knives in no time with this beautiful set. This stone sharpener has strong customer reviews. It’s double-sided with a 1000 and 1,600 grit side. The coarse side can be used to sharpen dull kitchen knives and the finer side will leave your knives with a magnificent, glimmering finished edge. 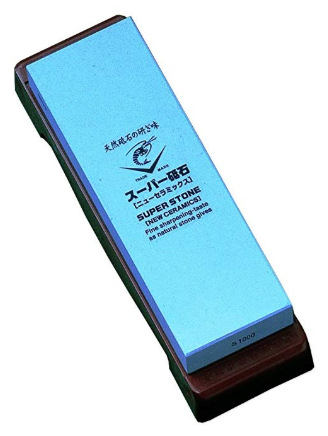 This stone can be used by novices with minimal practice and professional sharpeners alike. This is another affordable option of stone. The whetstone acts like sandpaper removing small particles of metal, called swarf, every time the metal passes the surface of the stone. Because of this, coarse grains cut faster than fine grains and softer stones cut faster than hard stones. The reason that soft stones cut faster is that each pass of the metal not only removes swarf. It also removes particles on the surface on the whetstones, called slurry. It then exposes a new, fresh layer of particles on the surface of the whetstone. The building of the swarf will eventually affect the effectiveness of the stone by clogging it. To counter this some whetstones use water and others oil to lubricate the whetstone and suspend the swarf. With whetstones, you definitely get what you pay for.